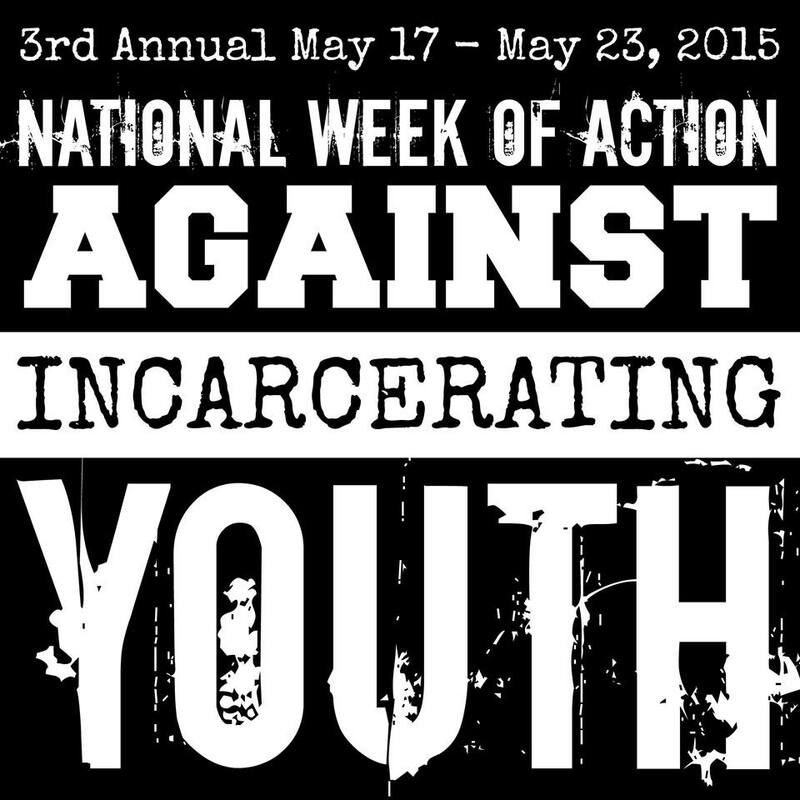 The National Week of Action Against Incarcerating Youth is a fully-volunteer project organized by hundreds of groups and individuals around the United States. We are looking for groups and individuals around the United States to organize events. The juvenile justice system targets four youth group for incarceration; they are the following, in no specific order: (1) Youth of Color, (2) Youth with Disabilities, (3) Economically Disadvantaged Youth, and (4) LGBTTQQIA Youth. GOALS: Another world is possible, and it begins with community based programs and alternatives such as rehabilitation, therapy, counseling, job readiness workshops, tutoring, more community programs and centers, and transformative and restorative justice programs in the community and in schools to address conflicts. Incarceration is not the solution, but the problem. Once youth are involved in the juvenile justice system, it is hard for them to get out of it. Please support youth and their futures and demand that no more youth are incarcerated no matter the crime/harm they have committed. Incarceration does nothing to address the needs of the youth who have committed the harm. (1) Criminalization of Youth is the stigmatization of youth through laws and norms that are based on their behavior, dress, socializing, identity, and community they live in. (2) Policing of Youth is the surveillance and social controlling of youth by law enforcement and those in disciplinary roles. (3) Punitive Discipline of Youth is the punishment of youth which includes detention, out of school suspension, incarceration, home arrest, and probation. These three steps need to be eliminated in the juvenile justice system, which is the prison part of the school to prison pipeline. TACTICS: The events can take any form the group or individual wishes, such as a candlelight vigil, spoken-word mic night, protest, rally, teach-in, workshop, lecture, panel, banner drop over a bridge, walkout, conference, dinner, lunch, lobby day, dance, street theater, movie night, press conference, potluck, sit-in, parade, or pamphletting. **Segregation through economics is still socially present and is displayed through mass public school closures in poor urban communities, while wealthier school districts are being given more staff and resources. **Rather than more counselors in communities and schools, we fill them with police and SROs to manage conflicts through arresting youth not listening and giving them therapy. **With the rise of Ferguson Movement to defend Youth of Color against police brutality, this day is dedicate to addressing the racism in the juvenile justice system and the policing of Youth of Color. **From homelessness to incarceration, LGBTTQQIA are the highest per capita nationally of youth who are targeted for homelessness, suicide, and incarceration. **Police, because of their lack of knowledge and skills on issues around physical and mental disabilities, have been more likely to escalate conflict with youth with disabilities resulting in brutalization, death, and incarceration. **Recently, because of social awareness of sexism and girl empowerment, girls are not submitting to abusive authority and are fighting back against sexual assault from family members and boyfriends. As a result, girls are finding themselves the fastest growing group of youth that are being incarcerated. **The problem with the current juvenile justice system is it is punitive in nature, promoting mass incarceration, rather than a holistic, transformative, and restorative justice system. (4) because it acts as a bookend to the other National Week of Action. The other is organized by Dignity in Schools’ National Week of Action Against School Pushout, which is at the beginning of the school year. To be a sponsor is free. Just send us a message saying you want to organize an event and be a sponsor. 56. Prisoners Are People Too, Inc.